When I saw the second image last year, it got me wondering where I’d seen that line before. Then I remembered: aboard Al Asad airbase in Iraq, on the wall of a building occupied by Marines, someone had thoughtfully tacked on a number of Marine bumper stickers. One of them was similar to that shown in the first image. I find myself wondering whether this line first originated among military personnel or antiwar protesters, but I’m not bored enough to trace its etymology…. A long time ago (ca. mid-’00s), in a country far, far, away (i.e., Iraq), I came across “The Backstroke of the West“, and found it utterly hilarious. Well, this past (Chinese) New Year, an update was posted. Still hilarious. What was I doing when the planes hit the World Trade Center & the Pentagon? Honestly…I was asleep. I’d been up way too late the night before, hanging out with friends while watching “Con Air” for the first time; and, being a grad student with a cushy assistantship, my work hours were a bit more flexible than the standard 9-to-5. The lady in whose house I was boarding had long since left for work, so I had no notion of what had happened until, perchance, I bumped into a friend in the physics building (where I worked). As she narrated the morning’s events – first a plane hit one of the WTC towers, followed by a second plane hit the other, and a third one striking the Pentagon – my thoughts rapidly swung from, “Wow, that’s a heck of an accident,” to “Oh, hell, we’re under attack.” Then I was on my work computer, simultaneously attempting to 1) gather more info on the attacks, and 2) email my family to let them know I was okay. I wasn’t the best at keeping in touch under normal circumstances; however, being cognizant of my target-rich surroundings, I figured some reassurance was in order. Ironically, that recollection served to calm me, as I also recalled the events that (in the B5 storyline) were triggered by that utterance. Eventually, went home with some friends; for whatever reason, I didn’t feel like being alone at that time. We watched recycled news footage from the morning all afternoon, while I gradually got in touch with my family & friends. In most cases, this was routine; but one of my college friends actually worked in downtown Manhattan, and saw the WTC go down. I was quite reassured to hear her voice…. 1. Although, intellectually, I’d always understood the importance of the military & national defense, 9/11 brought this home to me. That said…9/11 didn’t factor into my decision to become a Marine; I’d already decided that over a year prior, and I was simply waiting to finish grad school before enlisting. 9/11 merely reinforced a decision already made. Indirectly, it did affect the course my life subsequently took, since it’s hard for me to imagine the Iraq war – and hence my deployment to that country – occurring sans 9/11. 2. Prior to 9/11, my attitude towards the rest of the world was a good deal more cosmopolitan; and I found it easier to see myself as a “citizen of the world”. After 9/11, my outlook became more nationalist, more unilateralist, more prone to favoring American interests over those of other nations. 3. My flirtation with neoconservative neocolonialism began soon afterwards. This was due to several factors: a) a pre-9/11 encounter with this essay in Parameters; b) the influence of neocon friends; and c) my pre-9/11 belief that the existence of failed states & poverty abroad could be largely boiled down to bad governance. 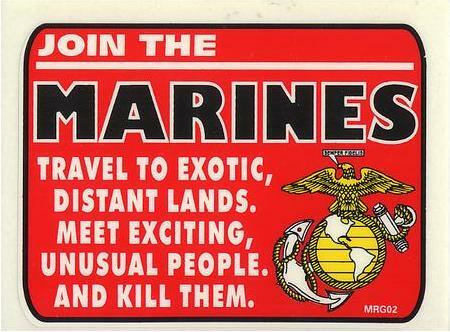 This infatuation persisted for a couple of years, but started to ebb when I attended several Marine Corps briefings on the Iraqi culture (as a prelude to my deployment to that troubled land). 1. The tactics employed in the attack. As an avid Clancy fan, who’d read Patriot Games, The Sum of All Fears, and Debt of Honor, I was well aware of the potential threat posed by terrorism, along with the notion of suicide-bombing-via-civilian-airliner. Indeed, a little over 5 yrs prior to 9/11, I was briefly a member of a Tom Clancy newsgroup, which one day featured an avid discussion of how to defend a city (say, Washington, DC) from such an attack. Lots of guys with military experience in that NG; and “TC” himself even made appearances on occasion. 2. Existence of people who hated us: I’d paid some attention to foreign affairs in the years preceding 9/11; the notion that our foreign policy might generate hatred abroad was therefore unsurprising to me. 3. I found much of Americans’ response to 9/11 – e.g., desire for retaliation; occasional xenophobia; support for military – unsurprising, given the obvious analogy to Pearl Harbor. 4. The use of emergency powers: Unlike most Americans, I’d previously made a hobby of reading about the exercise of emergency powers in previous wars (e.g., Civil War, WWI, WWII), and was therefore unsurprised by the post-9/11 use of such powers by Bush et al. From early on, my preference was for Bush to obtain Congressional sanction for the use of such powers, in keeping with the examples of Lincoln & FDR. I found his failure to do so (barely) acceptable, given the possibility that Congresscritters more concerned about civil liberties than security might deny such sanction. 5. The notion that America wasn’t immune to threats: I grew up during the tail end of the Cold War, and remember worrying about nuclear war. The notion that we lived in a dangerous world was hardly foreign to me. Moreover, while many Americans’ “holiday from history” might’ve lasted a decade, for me it lasted little over a year: from our victory in Desert Storm, ’till I read “The War in 2020” (which imagined a world wherein America wasn’t on top). I walked away from that book a bit less sanguine about our position in the world. (*) Besides the obvious, my use of this term is also a reference to Harry Turtledove’s Timeline-191. Thanks, apparently, to Gen. Abizaid, it seems “Long War” is now the officially-approved replacement for “(Global) War on Terror”. Although, given my druthers, we’d have adopted Pournelle’s phrase, “Black September War” (despite the historical ambiguity associated therewith), I suppose “Long War” is an improvement over its predecessor. I never much cared for the latter; just never sat right with me. Plus, GWOT sounds like a synonym for regurgitation. OTOH…was I the only one who noticed the disturbing allusion to Kim Stanley Robinson’s Years of Rice and Salt? Color me overly-sensitive, but I don’t find the notion of a multi-decade war with the Islamic world, which bleeds all sides white, and is ended only by the firebombing of the Dar al-Islam, to be terribly reassuring…. Here’s hoping Gen. Abizaid’s allusion was unintentional. As much fun as a real-life Century War might be…. Aside: Here’s an interesting essay on the history, and current practice (as of 1995), of naming operations. Reading this post by Tyler Cowen (as well as the David Brooks column it spawned) brought to mind one of my favorite SF novels: The Chronoliths, by Robert Charles Wilson (*). Although Cowen’s notion of the “mass sterilization of half of humanity” differs considerably from Wilson’s scenario, the two share a common focus on how our expectations can shape the future. The Chronoliths features someone named “Kuin” transmitting exotic-matter monuments (to his own future victories) back in time, with the first so-called “Chronolith” arriving when the novel begins, and subsequent ones appearing over the next twenty years. Each such monument commemorates the surrender of a given portion of territory to “Kuin”, at a date 243 months from the date on which it arrives. While the arrival of the first Chronolith is treated as a curiosity, subsequent ones provoke panic, economic depression, & political instability throughout Asia (and ultimately the world). Though Wilson’s characters largely treat such developments as a given, the underlying rationale isn’t difficult to figure out. From the beginning, it’s obvious the Chronoliths are the product of technology far in advance of anything available in the time(s) at which they arrive; and, of course, the military implications of advanced technology are obvious. Moreover, while one Chronolith might be thought an aberration, the arrival of many at semi-regular intervals gives credence to the notion that some organized force really is behind them, and that they are in fact what they purport to be. Plus, “Kuin” (the conqueror whose victories the Chronoliths commemorate) will sometimes transmit his monuments into the centers of major metropolitan areas (with 9/11-level casualties each time). With expropriation by some future conqueror becomes plausible, it’s understandable that both foreign & domestic investors might avoid nations “targeted” by Chronoliths. Investors with a shorter timeframe might nevertheless be concerned about seeing their property, factories, etc., blown to smithereens by, say, a freak Chronolith arrival in a given metropolitan area; or the dangers of political instability & anarchy (see below); or the impact of other investors’ skittishness upon the liquidity of the secondary markets which they’d need IOT liquidate their long-term investments prior to any Chronolith conquest date(s). Also plausible is falling demand for anything one plans to hold for the long term – e.g., real-estate within Chronolith-targeted areas; capital goods; non-tradable durable goods; etc. It’s not implausible that any exporters capable of relocation would outsource operations…and there goes another growth engine. Not discussed by Wilson, but also quite plausible, is a mass exodus of those who can afford to emigrate. Of course, this hits the labor forces in the Chronolith-affected areas. So, for starters, we have falling investment, and hits to production, net exports, & consumption. Perhaps also housing & commercial real-estate crashes, depending on how far demand falls in both of those areas. A financial crisis would not be out of the question, given local banks’ probable exposure to at least one of the aforementioned events. Also plausible is the political instability & anarchy that engulfs Asia in the “Age of the Chronoliths”. After all, if one was reasonably certain that “Kuin” was going to conquer your country in the not-too-distant future; and you didn’t want to emigrate; wouldn’t you try & get on his good side? Say, by joining political factions, militias, gangs, etc., purporting to fly his banner? Likewise, it’s understandable that many of the poor, disenfranchised, oppressed – i.e., people for whom the current system wasn’t working – might conclude that a Kuinist hegemony could hardly be worse than their current predicament(s); and that they therefore had nothing to lose by signing on. Eventually, Chronolith-targeted areas become so unstable that pundits both within & without begin to wonder whether conquest by Kuin could possibly be worse than the then-prevailing instability. Others, who dislike the notion of Kuinist hegemony, may nevertheless despair of fighting someone who can presumably get inside one’s OODA loop simply by reading a history book…and hence an appeasement faction (dubbed “Copperheads”) is born outside Chronolith-affected regions. Of course, you also get feedback from all of the above. Political instability abets economic decline, which increases unemployment, and yields more fodder for Kuinist factions (& their opponents); rinse, lather, repeat. Thus, by exploiting expectations (via a bit of advanced technology), the Chronoliths’ originators transform the world into kindling for eventual Kuinist conquest. Aside: I’ve often wondered whether the scenario of The Chronoliths was also an allegory for the Cold War. (*) It also brings to mind the Niven short story, “Inconstant Moon”, in which a solar flare cooks the eastern hemisphere during nighttime on the western hemisphere. Bryan Caplan had a somewhat more optimistic take on Cowen’s scenario.